"I tried to stop him with my hand, then from the other hand he threw the bottle at me on my head," the driver said. "After that, he started punching me." An Uber driver was attacked by passengers Saturday night in Arlington, Virginia, after he asked them to throw out the beer they were drinking in his car, according to the driver and police. The driver, who asked that News4 withhold his name, was punched and hit in the head with a glass bottle when three men from Woodbridge, Virginia, attacked him, police said. The trouble began when the driver picked up six passengers before 11 p.m. Saturday night on Pollard Street. The group was boisterous, and soon the driver heard beer bottles clinking, he said. He pulled over the car on the 500 block of S. Washington Boulevard, near the Pentagon and the south end of Arlington National Cemetery, and asked the passengers to throw out the beer. But instead of complying, one of the men opened a passenger-side door and tried to pull the keys out of the ignition. Then he began to hit the driver, he and police said. 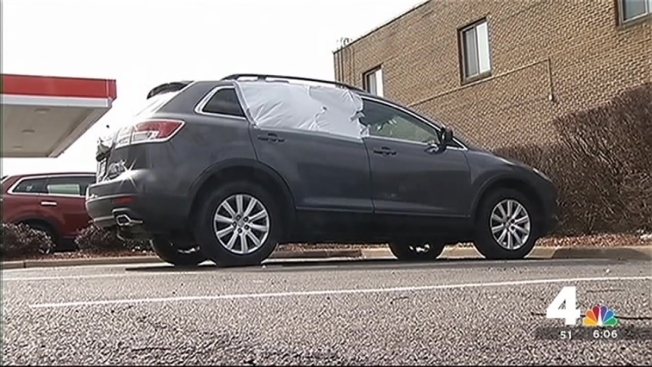 A passenger then shattered one of the car's windows, and the group scattered. Lance Ingram, 25, was charged with assault by mob. Justin Norconk, 26, was charged with malicious wounding and assault by mob. Jeffrey Rowe, 26, was charged with destruction of property. All three men live in Woodbridge, Virginia, police said. They are being held without bond. "We take this very seriously. No. 1, they shouldn't have been consuming alcohol in the car, so he is in the right to ask them to refrain from doing so," Arlington County Police Department spokeswoman Ashley Savage said. "And then to violently attack him is absolutely inappropriate." The men were arrested after police saw them leaving the scene in a taxi. Information on attorneys for the men was not immediately available. Uber said the company has a zero-tolerance policy regarding harassment and abuse. The accounts of the two passengers who requested and split the ride Saturday night were immediately deactivated pending an investigation. "Uber expects everyone in our community to treat each other with respect and common courtesy," a representative said. "We've been in touch with the driver-partner and stand ready to assist the authorities with their investigation."